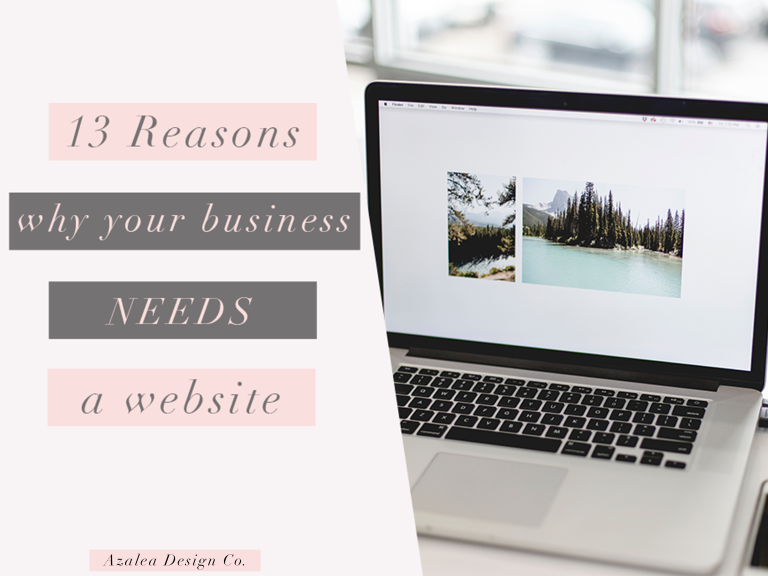 TheBestOf Taunton & Bridgwater | 13 Reasons Why Your Business NEEDS a Website - Azalea Design Co.
1. Attract a larger audience. 2. Be where your potential customers are. If you owned an ice cream truck the best place to be is at the park on a nice summer's day. If you parked it on a mountain range in the middle of winter, you probably won't get as many customers. This is so true with being online, too. If you limit your business to your local area you are also limiting your sales and success. Your potential customers could be in other countries and being online makes your business accessible to every internet user in the world! A business's website has all the information that any customer could want all in one place (like, opening and closing times, location, products/services, prices, contact information, reviews, social media etc.) So what ever customers may be looking for, they know that your website will give them answers. Therefore your website is the first place they will go to and if you do not have a website, you may give the impression that you are no longer in business. 4. Your competitors have one. Let's face it, most businesses have a website, including your competitors. If your competitors can offer customers an in- store and online experience, whichever is most convenient for its customers, they will increase their sales. The trick is to match your competitors and offer something different! 5. Most convenient for customers. In this millennial age, we tend to go for the easiest route. For example, we would rather sit at home on our comfy sofa searching for a specific product online than walking through town in and out of shops searching high and low in shop aisles. With search engines like Google, it is so simple to type in a product and instantly find businesses that sell exactly what you are looking for. Even if you own a local store, your customer may check your website to see if you sell it before they walk down to your store and purchase it. With a store there are opening and closing times - if the store is closed you won't get any sales. However, with a website it is always available which means that customers can browse your site and make purchases whenever is convenient for them. Your website is the home of your business and it is always open! If you run a service based business the best way to make sales is by showing your work and services in action. For example, if you are a photographer the way to convince clients to book with you is by showing them your photography portfolio. Your website is the best place to showcase this. Having a website indubitably increases your business's visibility as your business is exposed to a much larger audience, as opposed to your local customers purchasing in-store. Obviously, the more visibility your business gets, the more chance of sales! 9. Show and share your knowledge with customers. Your website is a great platform to share your expertise with your customers, for example a great way to do this would be through a blog. This way you can show your customers that you have knowledge and experience in your area which builds trust and they will feel more able to invest in your products or services. 10. Builds trust and credibility. As I said before, by having great content on your website it allows you to build trust with your customers, If you are an expert in your area, your customers can rely on your business to help them. By having a website, it also builds credibility as it shows past customers' experiences through testimonials or through your work portfolio or your blogs. All of this shows potential customers that they can trust you and be able to invest in your business. 11. Customers are kept informed. Whether you have an email list or not, having a website to display all of your new products or services or offers is a great way to update your customers and keep them in the loop which can in turn increase sales. I know communicating with your customers is mostly for social media, but why not your website too? If potential customers have any queries about what you offer, they can easily contact you through your website rather than finding any of your social media accounts. Being available to respond to your customers also helps you build relationships with them which is always beneficial. When you have your own website, you also get analytics on your viewers. This information is already collected and displayed for you to use. You can gage your audience demographics in terms of their age, gender, where they live and what day and time they visited your site. It can show you the path the viewer took on your website, the amount of viewers and how they found your website (through social media, search, advert or direct.) All of this information is ideal for you to be able to improve your website and appeal to your target audience whilst growing your business. Although having a website is important for a business, having a customer friendly website that is easy to navigate is the most important. Around 38% of people will leave a website if the layout is unattractive and most users stick around for less than 59 seconds. If your website doesn't capture their attention or is too difficult to navigate, you will lose a potential customer is less than a minute. So get in contact with us today to see how we can help get your business's website live in time for the New Year.